The Japanese card of the day for April 24th, 2018, is Giro. 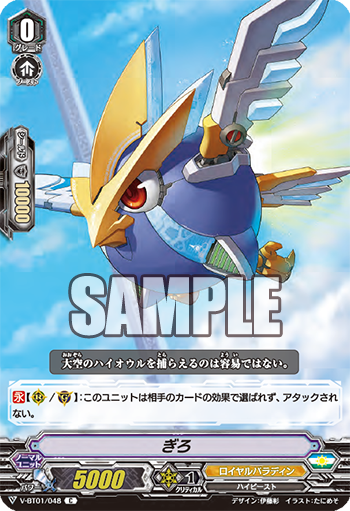 A Royal Paladin Common from V-BT01: UNITE! TEAM Q4, Giro is easy to write off for being a Normal Unit grade 0 without Forerunner--no matter what he brings to a deck, he does it by reducing your overall probability to ride to grade 3 consistently. But the card is a template of things to come, and foreshadows some interesting mechanics we have yet to see from the Standard format. At first blush this might sound like the Resist keyword from the old format, but it's slightly different. It's true that Resist prevented cards from being chosen for effects, and in that regard Giro can't be targeted by the likes of Berserk Dragon or Nehalem, while Vortex Dragon's effect of "retire all of your opponent's rearguards" can still blow him away because it doesn't choose anything. But Giro takes this to the next level by being a unit that can't be attacked, which has some interesting applications; supposing we were going to run this for a second, putting Giro up front would limit the opponent's attack targets. Doubling up on Giro would force a Dragonic Overlord to only attack the vanguard with its higher base power, making it easier to defend and stop the restand skill. It's likewise interesting that Giro is unaffected on the Guardian Circle because nothing actually interacts with the Guardian Circle just yet. With Dimension Police receiving support in Extra Booster 02: Champions of the Asia Circuit, it's possible we'll see a more restrained implementation of the guard break mechanics they developed in the past. What Giro's really hinting at is that there will be skills that affect guardians in Standard--potentially more than just retiring guardians, there could be cards that decrease their shield, or switch them with other units. Rather than Giro himself though, you should be looking for when this skill starts hitting grade 1 and 2 units. Giro is designed by manga author Itou Akira and illustrated by Tanimeso. The two are also collaborating on Machining Stag Beetle. The previous Japanese cards of the day were Damanance Dragon and Savage Hellfire Gabiya. V-Booster Set 01: UNITE! TEAM Q4 will launch in Japan May 25th, 2018, and in English June 22nd, 2018. It will be accompanied by sleeves based on Dragonic Overlord and Blaster Blade. V-Trial Deck 01: Sendou Aichi and V-TD02: Kai Toshiki will launch in Japanese May 11th, 2018, and in English June 8th, 2018. They will be accompanied by a new sleeve based on the "Imaginary Gift" design.